Israelis are set to vote in their country's most closely fought general election in years. 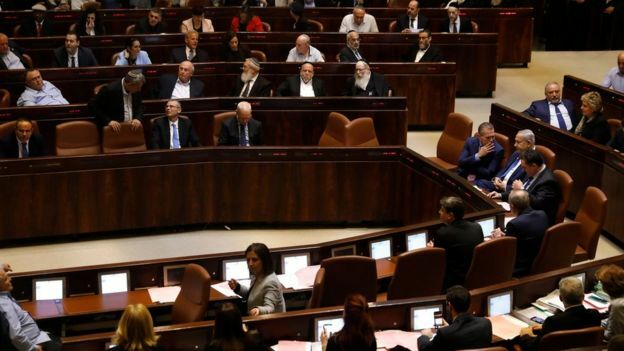 No party has won a majority in Israel's 120-seat parliament, the Knesset, so as soon as the results start coming in at 22:00 (19:00 GMT) on Tuesday negotiations start on the formation of a governing coalition. At a rally in Jerusalem on Monday, Mr Netanyahu told Likud supporters not to be "complacent" and urged them to turn out at polling stations. He warned that his "leftist" rivals could still win. The BBC's Tom Bateman in Jerusalem says Mr Netanyahu has appealed to Israel's increasingly right-wing voter base with tough messages on security and a significant announcement in the final days suggesting a new government would annex Jewish settlements in the occupied West Bank. The prime minister denies the corruption allegations, and says he is a victim of a political "witch-hunt" aimed at influencing the election. "The whole purpose is to create a legal fortress to guarantee his legal immunity in front of the serious charges he is facing," he said. But, our correspondent adds, in Israel's fragmented party system the advantage remains with Mr Netanyahu, who still looks most likely to be able to form a new coalition government.